Jun 21, 2016 in "Frozen Ever After"
The long awaited Frozen Ever After ride is now open at Epcot's Norway Pavilion. Large crowds gathered this morning in World Showcase ahead of the attractions 9am opening. Stop reading now if you do not want to see the queue area and a video ride-through. 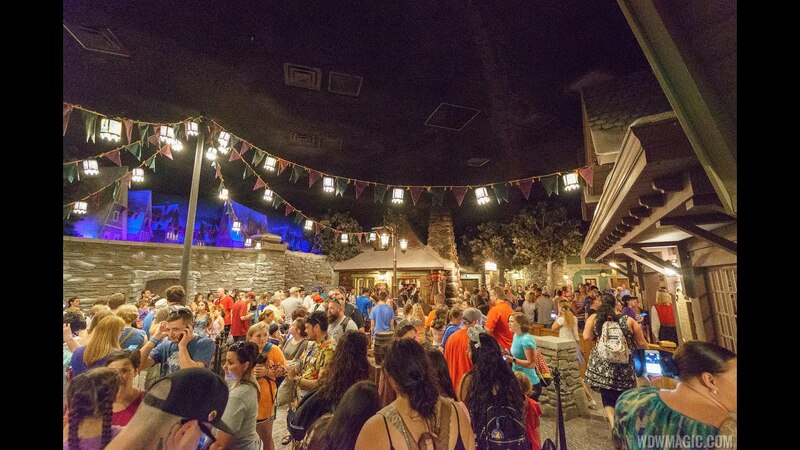 A brand new inside queue area makes use of the old movie theater from the Maelstrom. The queue area is nicely detailed, and includes a few nods to the former Maelstrom. The ride uses the same ride system as the former maelstrom, but a few tweaks to the track and all new show scenes make it hard to recognize much from before. There are impressive Audio Animatronic figures, and of course a very familiar sound track. Check out our video for a complete walkthrough of the queue and an onboard POV video of the ride. Wait times quickly jumped to over 3 hours, with the queue extending all the way to the Outpost beyond China. Frozen Ever After is open daily from 9am to park close, and is part of morning and evening Extra Magic Hours. FastPass+ is available, and is highly recommended. Also now open is the Royal Sommerhus Frozen meet and greet. The meet and greet is part of a newly expanded Norway pavilion, that also includes a new Frozen gift shop and expanded restrooms.